RV Sites | Check-in: 2 p.m. • Check-out: 11 a.m. Vacation Rentals | Check-in: 2 p.m. • Check-out: 11 a.m. Located in the vacation destination of Old Mystic, CT, Seaport offers an East Coast retreat that you won’t soon forget. Choose a spacious RV or tent site, or stay in a cozy rental. Amenities include a heated swimming pool, miniature golf, basketball and more. 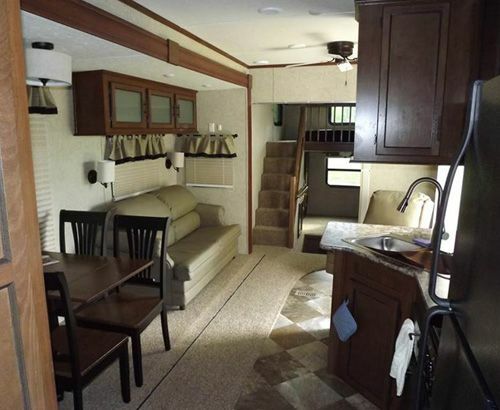 Our vacation rental RV's can sleep up to six people and have water, electricity, cable and A/C. A picnic table and fire ring is included outside. Guest must bring their own linens. Nearby, you’ll find the charming town of Mystic and all things maritime, including the famous Mystic Seaport! NOTE: Please call the resort to book long term, seasonal stays.